One of the main challenges in wildlife conservation biology is to understand what factors affect vulnerable wildlife populations over time. Scientists have been trying to understand these factors to estimate how much hunting in a season is sustainable, but the lack of long-term monitoring data, especially in remote areas such as the Arctic, makes this task very difficult to accomplish. In a new study published in Proceedings of the National Academy of Sciences, scientists at the University of Ottawa used a novel method to bypass this lack of data and track how nesting bird populations changed over time, even before population census data were collected. 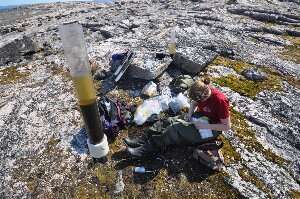 Professor Jules Blais and his team analyzed sediment cores from the bottom of small lakes and ponds in Canada's Eastern Arctic to examine the levels of a range of chemical compounds in the cores' composition. "When birds colonize an area, they begin to fertilize the local environment, drastically changing the nutrient levels in the water," explained lead author Dr. Kathryn Hargan, a W. Garfield Weston postdoctoral fellow and a L'Oréal-UNESCO postdoctoral fellow at the University of Ottawa at the time the research was done. "Over time, sediments slowly accumulate at the bottom of lakes, archiving a detailed history of the biological changes in those bodies of water, much like tree rings reveal historical information." The common eider, an Arctic seaduck prized by the Inuit for its meat and down, once numbered in the millions, but reports by Northerners and some wildlife surveys suggested substantial reductions in recent decades. Although hunting pressures were suspected to be the cause of the population decline, this study was able to demonstrate that the eider population decline observed in the seaduck's main breeding range coincided with increased sales in firearms and motorized boats in Greenland, indicating eider harvest at that time was unsustainable. 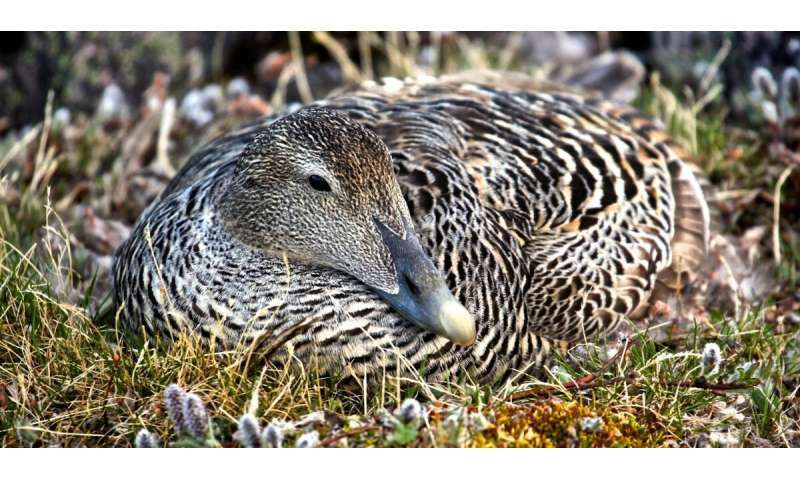 In the Hudson Strait near Cape Dorset, Nunavut – the common eider's main nesting and breeding area – the scientists found evidence that populations declined in the mid to late 20th century, during a period of intense hunting by Greenlanders and the relocation of nearby Inuit communities. In more isolated eider nesting sites, with lower hunting pressure, scientists found that populations remained stable. "The fact that traces of hunting practices over the last century can be detected in the nutrient profiles of pond sediment in the Arctic is fascinating," added Prof. Blais. "Tools such as these offer a new perspective into tracking environmental changes going back hundreds of years, and can potentially revolutionize wildlife conservation efforts."